If your mountain laurel has leaf spots or chlorotic foliage, you may be wondering, “Is my mountain laurel sick.” Like all plants, mountain laurels have their share of diseases. Diseases of mountain laurel tend to be primarily fungal. It is important to learn the signs of these diseases in order to treat sick mountain laurels as soon as possible and nip the problem in the bud so to speak. Help, What’s Wrong with My Mountain Laurel? Identifying what is making your mountain laurel sick means examining its symptoms. If your laurel’s foliage has spots, the likely culprit is a fungal disease like leaf spot. 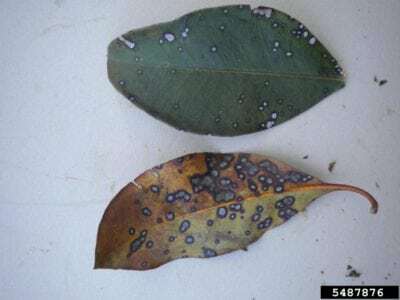 There are at least a dozen fungal pathogens that cause leaf spot and to be really sure which one you may have, you would have to have the diseased area tested by a laboratory. Leaf spot is caused when trees are over crowded, shaded and in excessively moist areas. The good news is that leaf spot doesn’t usually do long-term damage to the shrub, provided you manage the problem. Sick mountain laurels should be pruned and the infected leaves removed. Also, rake and clean up fallen leaves and be sure to water only at the base (root) of the plant to avoid getting the leaves wet, which can foster many of these diseases. Another, more serious disease of mountain laurels is botryosphaeria canker. 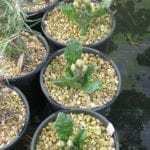 It afflicts many other plants besides laurel and is, again, a fungal disease. Spores enter plants through pruning wounds or other damaged areas as well as through the natural openings in the plant tissue. Once the spores have infiltrated the area, a canker is formed and, as the disease progresses, the entire branch dies back. Generally, this particular mountain laurel disease infects one branch at a time. The first symptom will be leaves curling downward followed by the appearance of a circular canker. Plants are most susceptible to botryosphaeria canker when they are under stress, whether from drought, heat, damage, or overcrowding. There is no cure-all for this disease, but it can be managed. On a dry day, prune out any infected branches and then burn them or throw them away. Remove the branch about 6-8 inches (15-20 cm.) beneath the canker. Sanitize your pruning shears with a 10% bleach solution between each cut so you do not transfer the disease to other plants. 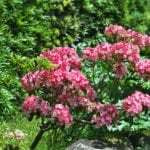 What is making your mountain laurel look peaked may not be a disease. Mountain laurels thrive in well-draining soil rich with organic matter and in partial shade. Yellowing leaves (chlorosis) may be a sign of a lack of iron. This is the result of soil that is too acidic and can be treated by using an iron chelate compound. Lastly, signs of damage to a mountain laurel may be signs of winter injury. These symptoms may be dieback or tip browning or splitting bark. Winter injury may be caused from too much or too late fertilization, sudden temperature fluxes, or late spring frosts. To prevent winter injury, deep water mountain laurels prior to the first winter freeze, don’t fertilize in the early fall or late summer, and mulch around the base of the plant to help it retain moisture.